I set out to dine at Oath Pizza in Mosaic District. I love Mosaic for its shopping and dining and cutesy vibes. It’s a great place to spend an afternoon out of the hustle and bustle of D.C. We recommend checking it out–go for dinner, shopping, and then catch a movie at the Angelica Theatre. 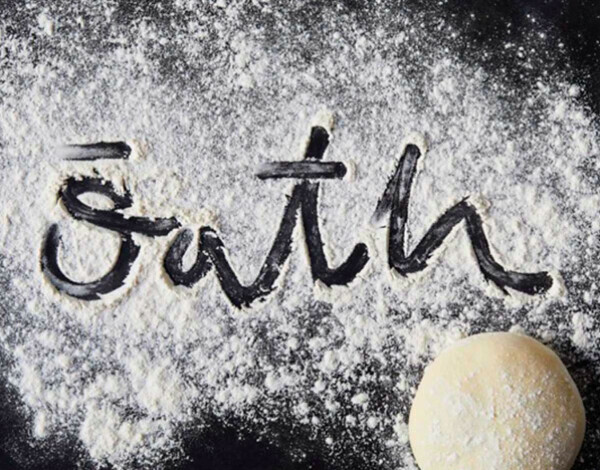 Oath Pizza is a unique pizza company that started in Nantucket. 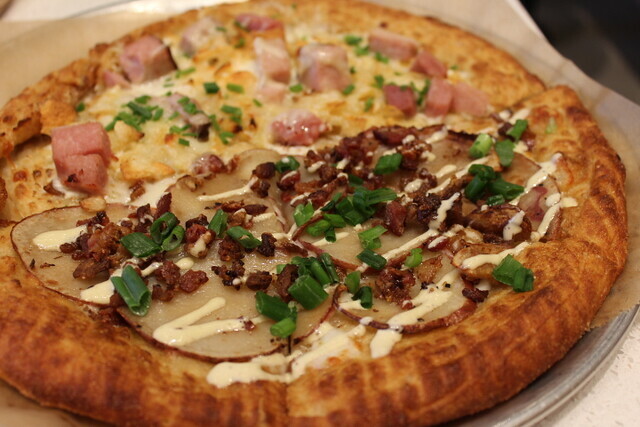 The company created its one-of-a-kind dough first and then built the concept of the restaurant around the dough. The dough is hand-stretched and grilled in avocado oil. 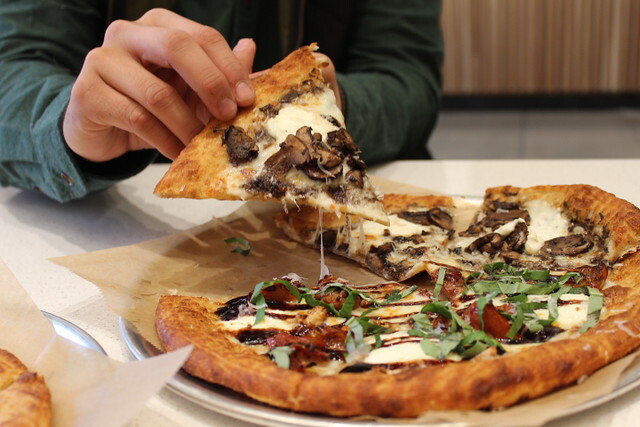 All of their ingredients and toppings are ethically sourced and sustainable. They are the first and only pizza chain that was granted certified humane. Farm-to-table pizza at a reasonable cost? We’re sold. The lovely manager set us up with several half servings of their famous pizza. We devoured the Dougie, Mother Clucker, Muffled Trushroom, Bella, and Luau pizzas. The Dougie was topped with mozzarella, roasted potatoes, bacon, scallions, and drizzled in ranch dressing You would think that a pizza with potatoes would be way too much–well, you’d be wrong. This pizza was delicious and the potatoes were nice and crisp because they were cut so thinly. The bacon and ranch is a winning combo as well. We were big fans. 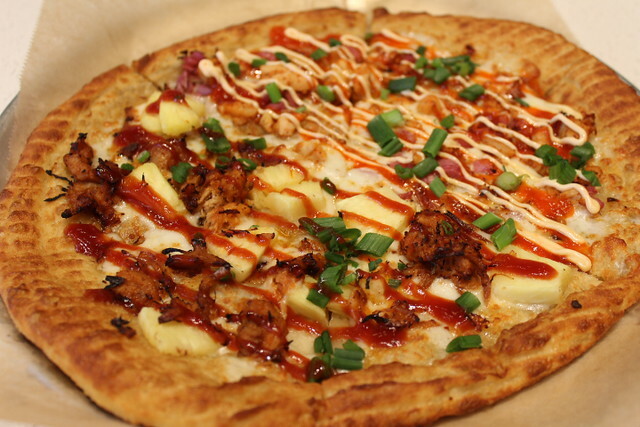 The Mother Clucker was spicy because of the Sriracha and spiced chicken. The mozzarella, pickled red onions, spicy aioli, and scallions all paired together nicely. We loved this pie and it provided us with a nice kick. We also loved the Luau pizza. I happen to love pineapple on pizza so this pie hit the spot. The barbeque pulled pork was flavorful and tender. It melted in your mouth. 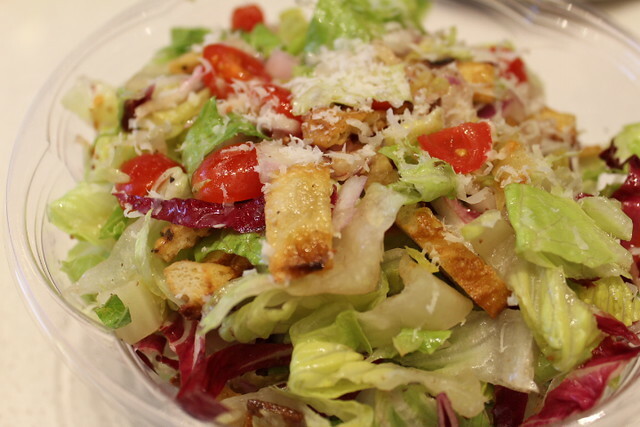 We also sampled one of their salads. We were delighted at the pre-mixed and pre-dressed salad that was not only easy and convenient to eat but also very tasty. We loved how the veggies were already chopped up and well mixed. They also nailed their veggies–not just their carbs. The Bella and Muffled Trushroom pies are the vegetarian options on the menu. 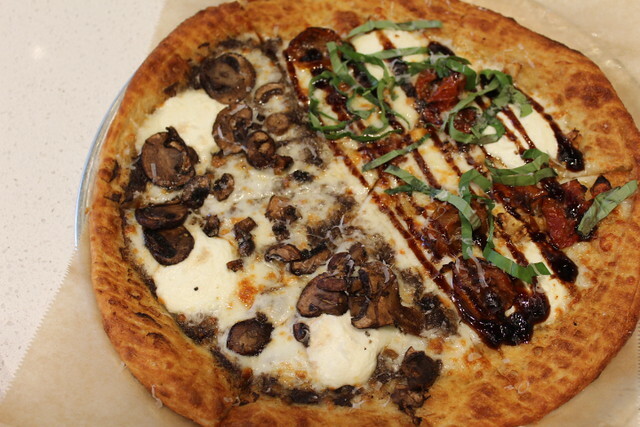 The house-made truffle sauce was super tasty and paired well with the mozzarella, ricotta, and roasted mushrooms. This is a great option for vegetarians. We also loved the Bella. This pie was their classic tomato, mozzarella, and basil combo. We loved this pizza–and so does everyone else, it’s their most popular dish. Now, let’s talk about the crust. It was delicious. It’s thin, crispy, and incredibly flavorful. You can definitely taste the difference from the avocado oil. This is one pizza you won’t want to leave the crusts on your plate. 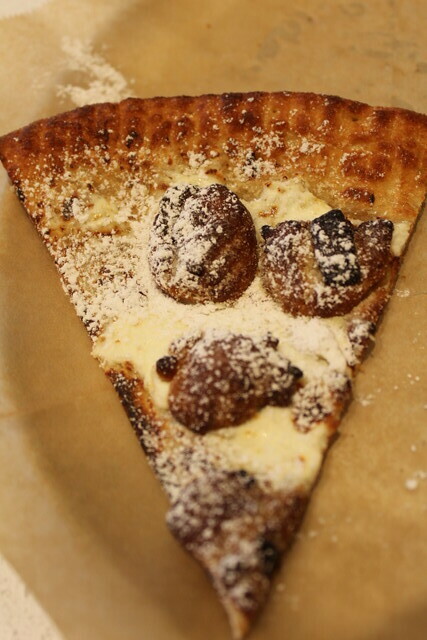 We also tried the chocolate chunk cookie pizza. Can you blame us? We were skeptical about the ricotta cheese and chocolate combination. However, we loved this dish as well. It was the perfect ending to a tasty meal. Can’t make it out to Mosaic District? Don’t fret. They’re opening up Oath Pizzas in Navy Yard and on H Street soon. We can’t wait! In the meantime, we’ll definitely be back to the Mosaic location.